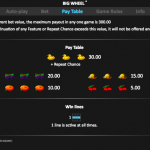 It is all about big wins in Big Wheel, a classic video slot game from Realistic Gaming. This is a classic fruit machine that we gladly play whenever we can. The design of the game is simple yet appealing. We can see most of the fruits we are used to seeing in classic slots like cherries, oranges and grapes, just to name some. For a classic slot Big Wheel has a plenty of features to offer. The Big Wheel symbol is the bonus symbol and it appears on the center reel, and when it does it awards you with one of the following features. Super Jackpot is where you will receive the 3 ducks jackpot but with a chance to repeat the win up to 9 times. Round About awards you with a cash prize. Roller Coaster will award you the cash prize that is equivalent to the meter that is fully lit. Crazy Reels awards you with random number of free spins. Ring The Bell is where the reels will nudge along until you land a bell which is then collected and you will receive the appropriate prize for that. And the last feature is the Duck Shoot is where you have 3 chances to get the highest paying award if you lit all the lights. Big Wheel is definitely one heck of a game. Realistic Game took us by surprise with this online slot, since we did not expect it to be so versatile and it is. So this is another example that we should not judge a book by its cover. We had a nice lucrative session and for that reason we believe that if you give the game a chance you will enjoy it the same way we did. For another great engaging game you should consider playing 8th Wonder a 3 reel slot by Realistic Games.